Xytronix (ControlByWeb) WebRelay-Quad [XWR4R1] has four low-signal relays that can individually switch up to 1 Amp at 28V. Each relay can be turned on, off, or pulsed using the built-in web pages or by running custom scripts from a computer or dedicated controller. 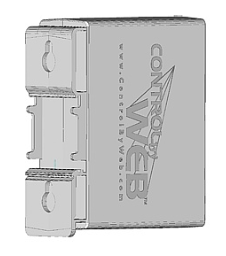 It is extremely versatile and can be made to fit almost any remote relay control need. The WebRelay-Quad is fully configured in minutes using a web browser. No additional software is needed. When integrated with iMCA System, you can not only remotely control 4 Normal Open or Normal Closed relays and attached devices from virtually anywhere, but also create virtual connections with any sensors registered in the iMCA System such as temperature, humidity, vibration, flood, air flow, PIR detectors, GAS detectors, etc. You can easily create and execute any number of automation scenarios based on time schedule or sensor information, without having to deal with any cryptic codes or learning a scripting language. Ideal for small to medium size projects where remote power control required. When used with the iMCA System and its state sensors (including this unit itself) it is useful for quick visual monitoring of states of various objects like doors/windows open/closed etc. Built-in web server for setup and remote relay control from a web-browser. PFour independent, 28V 1A relays (SPDT). Rugged, compact enclosure can be DIN-Rail or Wall mounted. Includes a 2-piece (14-pin) industrial terminal connector that makes connections convenient. You can source Xytronix (ControlByWeb): WebRelay-Quad [XWR4R1] from the vendor directly, your preferred distributor or from us as a standalone module for US $200 (plus postage and handling) or as a part of iMCA Controller package. As we work with our clients directly helping to shape their automation projects we do our best to minimise all costs wherever possible. Please contact our support service should you have any questions relating to this hardware or how it can be in use for your automation project.